"A fall flavor in a traditional Italian cookie! If desired, dust with confectioners' sugar before serving." 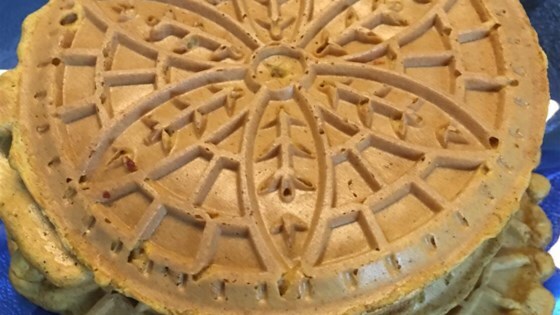 Preheat pizzelle iron according to manufacturer's instructions. Combine flour, cinnamon, baking powder, pumpkin pie spice, nutmeg, and allspice together in a bowl. Beat sugar and eggs together in a bowl using an electric mixer. Add butter; beat until blended. Add pumpkin puree and vanilla extract; beat until blended. Add flour mixture and mix on medium speed until smooth batter forms. Drop a tablespoon of batter onto the preheated iron. Bake until golden, 30 to 40 seconds, or a few seconds longer for darker pizzelle. Remove cookies from the pizzelle press by lifting gently with a fork or spatula; cool on waxed paper. I use a 1-tablespoon melon baller to measure even amounts of batter for each pizzelle. These cookies are best cooked a little longer or on a higher setting with your press.